Throw farther. Approach with control. Make more putts. 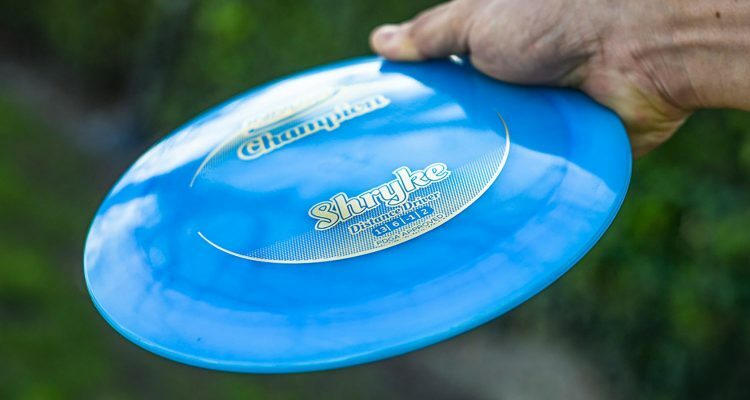 When you have the right discs, your disc golf game can improve quickly. To make the search easier, we’ve put every Innova disc into one list sortable by Disc Name, Speed, Glide, Turn, Fade, and Abbreviation. Now, go find the best discs for your game! Most of our discs have the weight (in grams) and the disc mold abbreviation on the bottom center of the disc. This helps to identify discs, especially custom stamped discs. Some discs have a prefix signifying the type of plastic: Star Plastic may have an S or ★ in front of the model letters. Echo Plastic may have ES or E★ in front of the model letters. Star, Pro and R-Pro discs may have a / – or . between the plastic type (S, P or R) and the disc model abbreviation. The best way to determine how a disc will fly is to have a point of reference. If you’ve thrown one of the discs on the chart, you’ll be able to relate your experience to our disc ratings, and determine how our other discs fly. If you’re unfamiliar with terms like speed, glide, turn and fade, we suggest you check out how our flight ratings system is designed. Aero 3 6 0 0 AE !dx! !putt-approach! Ape 13 5 0 4 APE !blizzard! !champion! !dx! !star! !distance-driver! Archangel 8 6 -4 1 AA !dx! !fairway-driver! Archon 11 5 -2 2 AC !champion! !echostar! !glow champion! !gstar! !star! !distance-driver! Atlas 5 4 0 1 !champion! !star! !xt! !mid-range-disc! Aviar 2 3 0 1 !champion! !dx! !glow! !gstar! !r-pro! !star! !xt! !putt-approach! Aviar Driver 2 3 0 2 BB !gstar! !star! !putt-approach! Aviar3 3 2 0 2 AV3 !dx! !star! !putt-approach! AviarX3 3 2 0 3 AX3 !star! !putt-approach! Banshee 7 3 0 3 BA, B !champion! !dx! !fairway-driver! Beast 10 5 -2 2 BST !blizzard! !champion! !dx! !glow! !gstar! !pro! !star! !distance-driver! Birdie 1 2 0 0 BD !dx! !putt-approach! Boss 13 5 -1 3 BO !blizzard! !champion! !dx! !echostar! !gstar! !pro! !r-pro! !star! !starlite! !distance-driver! Bullfrog 3 1 0 1 !xt! !putt-approach! Caiman 5.5 2 0 4 !star! !mid-range-disc! Cheetah 6 4 -2 2 CH !dx! !fairway-driver! Classic Aviar 2 3 0 0 AV !dx! !putt-approach! Cobra 4 5 -2 2 CO !dx! !mid-range-disc! Colossus 14 5 -2 3 CS !champion! !gstar! !star! !distance-driver! Colt 3 4 -1 1 CL !dx! !gstar! !star! !xt! !putt-approach! Corvette 14 6 -1 2 !star! !distance-driver! Coyote 4 5 0 1 CY !star! !mid-range-disc! Cro 5 3 0 2 CRO !dx! !r-pro! !star! !mid-range-disc! Daedalus 13 6 -3 2 DL !champion! !gstar! !star! !distance-driver! Dart 3 4 0 0 DT !champion! !dx! !echostar! !gstar! !r-pro! !star! !putt-approach! Destroyer 12 5 -1 3 DS, D !blizzard! !champion! !dx! !echostar! !gstar! !metal flake! !pro! !star! !distance-driver! Dominator 13 5 -1 2 DM, DR !blizzard! !champion! !gstar! !distance-driver! Dragon 8 5 -2 2 DG !dx! !fairway-driver! Eagle 7 4 -1 3 EG, E, EX !champion! !dx! !star! !fairway-driver! Firebird 9 3 0 4 FB !champion! !dx! !gstar! !star! !distance-driver! Firestorm 14 4 -1 3 !champion! !distance-driver! FL 9 3 0 2 FL !star! !distance-driver! Foxbat 5 6 -1 0 FT !star! !mid-range-disc! Gator 5 2 0 4 GT !dx! !metal flake! !star! !mid-range-disc! Gazelle 6 4 0 2 GZ !dx! !fairway-driver! Groove 13 6 -2 2 GV !champion! !distance-driver! Hydra 3 3 0 2 HY !r-pro! !putt-approach! JK Aviar 2 3 0 2 JK !pro! !putt-approach! Katana 13 5 -3 3 KA !blizzard! !champion! !dx! !echostar! !glow champion! !gstar! !metal flake! !pro! !star! !distance-driver! KC Aviar 2 3 0 2 KC !pro! !putt-approach! King Cobra 4 5 0 2 CO !champion! !mid-range-disc! Kite 5 6 -3 1 KT, K !dx! !star! !mid-range-disc! Krait 11 5 -1 2 KR !blizzard! !champion! !gstar! !distance-driver! Leopard 6 5 -2 1 L !champion! !dx! !echostar! !gstar! !pro! !star! !fairway-driver! Leopard3 7 5 -2 1 L3 !champion! !dx! !glow champion! !gstar! !star! !fairway-driver! Mako 4 5 0 0 MK !echostar! !glow champion! !mid-range-disc! Mako3 5 5 0 0 MK3, MK !champion! !gstar! !star! !mid-range-disc! Mamba 11 6 -5 1 MB !champion! !echostar! !gstar! !metal flake! !star! !starlite! !distance-driver! Manta 5 5 -2 1 MN !champion! !dx! !gstar! !star! !mid-range-disc! Max 11 3 0 5 MAX !star! !distance-driver! Mirage 3 4 -3 0 MG !dx! !star! !putt-approach! Monarch 10 5 -4 1 MC !champion! !distance-driver! Monster 10 3 0 5 MO, M !champion! !star! !distance-driver! Mystere 11 6 -2 2 MY !gstar! !star! !distance-driver! Nova 2 3 0 0 !xt! !putt-approach! Orc 10 4 -1 3 ORC, O !champion! !dx! !gstar! !pro! !star! !distance-driver! Panther 5 4 -2 1 PA !champion! !mid-range-disc! Pig 3 1 0 3 PIG, P !r-pro! !putt-approach! Polecat 1 3 0 0 PC !dx! !r-pro! !putt-approach! Rat 4 2 0 3 RAT !star! !mid-range-disc! Rhyno 2 1 0 3 RY !champion! !dx! !gstar! !r-pro! !star! !putt-approach! Roadrunner 9 5 -4 1 RR !champion! !echostar! !glow champion! !gstar! !star! !starlite! !distance-driver! Roc 4 4 0 3 R, KCR, OR !dx! !glow! !pro! !star! !mid-range-disc! Roc+ 4 5 0 2 R+ !champion! !r-pro! !mid-range-disc! Roc3 5 4 0 3 R3, R !champion! !dx! !gstar! !metal flake! !star! !mid-range-disc! RocX3 5 4 0 3.5 RX3 !champion! !glow champion! !star! !mid-range-disc! Savant 9 5 -1 2 !star! Shark 4 4 0 2 SH !dx! !gstar! !star! !mid-range-disc! Shark3 5 4 0 2 SH3, SH !champion! !mid-range-disc! Shryke 13 6 -2 2 SY !champion! !glow champion! !gstar! !star! !distance-driver! Sidewinder 9 5 -3 1 SW !champion! !dx! !gstar! !star! !starlite! !distance-driver! Skeeter 5 5 -1 1 SK !dx! !gstar! !r-pro! !star! !mid-range-disc! Sonic 1 2 -4 0 !dx! !putt-approach! Spider 5 3 0 1 SP !dx! !star! !mid-range-disc! Starfire 10 4 0 3 SF !champion! !dx! !gstar! !pro! !star! !distance-driver! Stingray 4 5 -3 1 ST !dx! !star! !mid-range-disc! Stud 3 3 0 2 SD !dx! !star! !putt-approach! TeeBird 7 5 0 2 TB, T !champion! !dx! !echostar! !glow! !gstar! !metal flake! !star! !starlite! !fairway-driver! TeeBird3 8 4 0 2 T3 !gstar! !metal flake! !star! !fairway-driver! TeeDevil 12 5 -1 2 DV !blizzard! !star! !distance-driver! TeeRex 11 4 0 4 TR !star! !distance-driver! Tern 12 6 -3 2 TE !champion! !echostar! !glow champion! !gstar! !pro! !star! !starlite! !distance-driver! Thunderbird 9 5 0 2 TH !champion! !dx! !gstar! !metal flake! !pro! !star! !distance-driver! TL 7 5 -1 1 TL !champion! !star! !fairway-driver! TL3 8 4 -1 1 TL3 !gstar! !star! !fairway-driver! Valkyrie 9 4 -2 2 VL !champion! !dx! !echostar! !glow! !glow champion! !gstar! !pro! !star! !starlite! !distance-driver! VCobra 5 5 -1 2 VC !star! !mid-range-disc! Viking 9 4 -1 2 VG !champion! !dx! !distance-driver! Viper 6 4 1 5 VI, V !dx! !fairway-driver! VRoc 4 4 0 1 VR !champion! !dx! !gstar! !metal flake! !star! !mid-range-disc! Vulcan 13 5 -4 2 VU !blizzard! !champion! !gstar! !pro! !star! !distance-driver! Wahoo 12 6 -2 2 WA !r-pro! !distance-driver! Wedge 3.5 3 -3 1 WD, WE !dx! !star! !putt-approach! Whale 2 3 0 1 WL !champion! !dx! !gstar! !xt! !putt-approach! Whippet 6 3 1 5 WH, WX !dx! !fairway-driver! Wolf 4 3 -4 1 WF, W !dx! !mid-range-disc! Wombat 5 6 -1 0 WB !champion! !gstar! !mid-range-disc! Wombat3 5 6 -1 0 WB !champion! !dx! !star! !mid-range-disc! Wraith 11 5 -1 3 WR !blizzard! !champion! !dx! !echostar! !glow! !glow champion! !gstar! !metal flake! !pro! !star! !starlite! !distance-driver! XCaliber 12 5 0 4 XC !champion! !echostar! !star! !distance-driver! XD 3 4 -1 1 XD !dx! !putt-approach! Yeti Aviar 2 3 0 1 Ұ !pro! !putt-approach!